Dyson V11 Absolute Cordless Vacuum Review - UK's Best Vacuum Ever? Dyson V11 Absolute Cordless Vacuum Cleaner Review – The Best Vacuum Ever? With the release of the Cyclone V10 cordless vacuum, Dyson announced that it would no longer produce corded vacuums. Now that the V11 is here, that seems to be a decision that has paid off. By putting all of their resources behind this latest generation of cordless vacuums, they have produced a fantastic vacuum that will ensure you say goodbye to the cord for good. The Dyson V11 Absolute isn’t cheap, and this will be the main reason that holds customers back from purchasing one. It really is an excellent piece of kit though, with better suction, intelligent sensors, and even an LED screen to alert you of any problems, all of which make the high cost justified. V11 vs V10 vs V8 vs V7 vs V6 - What's the Difference? *Run time depends on which cleaning mode is in use. The design of the V11 Absolute is similar to the V10, but with a number of improvements. The vacuum comes with a choice of two colours: a new gold colour, and the traditional nickel/blue colour that we have become accustomed to. The V11 also keeps the same inline design of the V10, where the motor, cyclones and the dust bin are all aligned in a straight line. This means that the air flows through the whole vacuum in a straight line, resulting in more powerful suction and better performance. The battery pack is located flush against the trigger mechanism, with the dust bin on the other side. Dyson has done a good job with the design and ergonomics of the V11 Absolute, keeping it perfectly balanced as you hold it. The main design change of the V11 is the addition of an LED screen that is housed in the very top of the vacuum. At first, this seems like an unnecessary gimmick, but once you start using it you begin to see just how helpful it is. For starters, the new screen lets you know exactly how much cleaning time is left in the battery, to the second. This is an improvement over the V10, which had a basic battery level display to give a rough time. Have you ever had an issue with a cordless vacuum and spent an eternity trying to diagnose the problem? Dyson has come up with an ingenious solution. If you run into a problem, such as lack of suction or blocked filters, the screen will tell you exactly what is wrong. The best thing is, it will even play a short video describing how to fix the problem! The filter is located in the same place as previous models and is easily unscrewed from the vacuum. The filter is washable, and if you know how fast a filter can become clogged this is a feature that will save you a good chunk of money over the lifetime of the V11 Absolute. The dust bin is once again very easy to empty. You simply ‘point and shoot’ the dirt straight into the bin, which removes the annoyance of clouds of dust filling the room when you empty your vacuum. There is a lever at the side of the bin that pushes the dirt out so you don’t have to touch it, which is nice. The Dyson V11 Absolute comes with its own docking station which you attach to the wall. The docking station allows you to neatly store the vacuum (you can install it in a cupboard) as well as charge it. The docking station also includes space for all of the accessories, so there will be no need to rummage through the kitchen cupboards looking for the crevice tool. 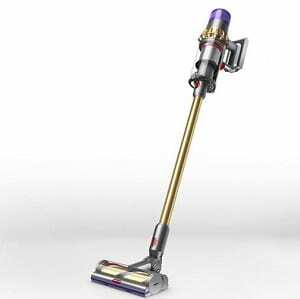 The Dyson V11 Absolute is by far the most technologically advanced vacuum cleaner on the market. A power management system, intelligent system performance monitor, and dynamic load sensors are just a few of features that ensure the vacuum is doing the most efficient job possible. In previous generations of Dyson cordless vacuums, there are different power modes depending on the type of floor you are cleaning, and depending on the size of the task. While this is a good thing to have in a vacuum, often you weren’t sure if you were using the correct mode, which resulted in non-optimal cleaning. There is also the problem of wasting precious battery life by fiddling with different switches trying to find the correct suction. This has all been eliminated in the V11, with the intelligent power management system automatically picking the best suction mode for the job at hand. You can actually hear the motor changing speed as you vacuum between a hard floor and a carpet, so you know your floors are being optimally cleaned. The Dynamic Load Sensor (DLS) monitors the resistance of the brush bar up to 360 times per second. This monitoring ensures that the vacuum uses the correct suction for the job at hand. The V11 Absolute also features the usual power trigger switch so you only use power when you are cleaning, which is another battery saving feature. The Dyson V11 features a real-time system performance monitor, which actively monitors system performance a whopping 8,000 times per second. Any issues will be reported on the integrated display screen, as well as a real-time countdown timer of the battery life. This is a handy feature to have as it means you will instantly know when there is a blockage or when the filter needs to be cleaned, instead of trying to guess what the problem is. The Dyson V11 Absolute is powered by the Dyson digital motor V11, which is one of the reasons why this cordless vacuum has the most powerful suction of any other cord-free vacuum, as well as most corded vacuums. 14 cyclones help to generate a huge amount of force which literally throws dirt from the floor and into the vacuum bin. The motor and other parts of the V11 have been acoustically engineered to be noise-friendly and keep the sound levels down as much as possible. The Dyson V11 Absolute has whole machine filtration, with a fully-sealed system and a HEPA filter. This is essential if you or anyone in your home suffers from allergies. Some vacuum cleaners will dispel dust back into the room when you are cleaning, creating an environment that is worse than when you started. The sealed system in the V11 ensures that every particle of air is directed through the filter, meaning none of it escapes back into the room. The HEPA filter captures 99.97 of all particles – including dust and allergens – leaving you with a much cleaner and safer living space. The HEPA filter can also be washed and is designed to last the lifetime of the vacuum, saving you money in the long run. The main improvement in Dyson’s latest generation of cordless vacuums is the introduction of the High Torque cleaner head. This really is a game changer, as it automatically detects which surface you are cleaning, and adjusts the power accordingly. This not only saves the hassle of fiddling with settings to find the correct power mode, but it also saves precious battery life. The technology that powers this feature is called Dynamic Load Sensor (DLS) and it monitors the brush bar resistance up to 360 times per second. If you are cleaning a carpet, there will be more resistance so the DLS will increase suction power. On hard floors, there will be less resistance so less suction will be required to clean, and the DLS will reduce suction. This setting can be overridden if you wish. There are 3 power modes on the V11 Absolute: eco, medium and boost. When the High Torque head is plugged in, the medium mode becomes auto mode, however, this can be overridden by switching to eco or boost mode. I really don’t see any need to change to another mode, as the auto mode has been designed for optimal cleaning performance. The High Torque cleaner head has an elastic polyurethane seal with pulls the head to the floor, creating better suction. It has stiff nylon bristles that drive deep into the carpet to remove ground-in dirt, and the soft carbon fibre filaments remove dust from hard floors. 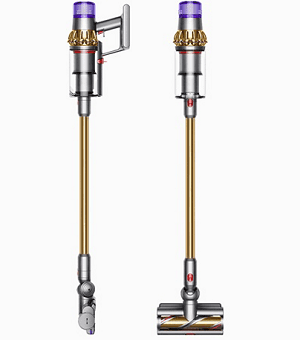 As with previous Dyson cordless vacuums, the V11 Absolute comes with an abundance of accessories and tools. As well as the Torque Drive head, there is a soft roller cleaner, mini motorised tool, combination tool, crevice tool, and a 2-in-1 soft dusting brush and stubborn dirt brush. Dyson have included a docking station with the V11, which allows you to store your vacuum as well as charge it. There is also room on the docking station for all of the accessories, so you don’t need to hunt in the kitchen cupboards when you need one. The docking station is actually the same one that came with previous models, so if you are upgrading there will be no need to install the new docking station, you can keep it as a spare. Those of you looking for an increased run time over the V10 may be slightly disappointed to find out that you still get 60 minutes of cleaning time. However, the battery has been improved to allow for the increased suction, so technically you won’t have to spend as much time cleaning. The 60 minute run time is when the vacuum is used in eco mode, this drops to around 40 minutes in medium or auto mode. If you use the boost mode you can expect 12 minutes of cleaning time, which is a 50% increase over the V10. You will rarely need to use the boost mode, most of the time eco or medium mode will be sufficient. 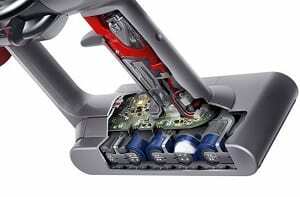 The battery in the Dyson V11 takes 4.5 hours to fully recharge, which is an hour longer than the V10. This is due to a bigger battery which is designed to accommodate the increased suction power. In all honesty, 60 minutes should be more than enough to clean your entire house, especially with the power management features and the trigger switch optimising battery usage. 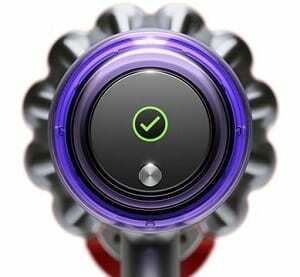 The Dyson V11 Absolute is a truly remarkable piece of cleaning technology. The integrated display screen is an unusual, yet ingenious addition. The larger capacity dust bin, 20% extra suction power, and intelligent cleaning sensors all combine to make this the only vacuum cleaner you need. While there is no getting away from the high price tag of the V11, there won’t be many people left feeling underwhelmed after trying it. After using this vacuum for a while, you will understand why Dyson no longer wants to produce corded models. Why bother when you can have a cordless vacuum with the performance, features, and technological advances such as the Dyson V11 Absolute?